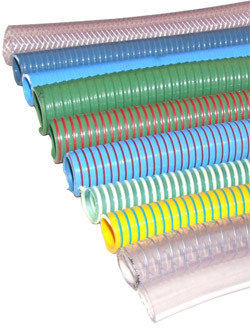 ADT Flexibles stock a very comprehensive range of PVC hose to suit all applications. In this section you will find a selection of the hose we supply from stock, but please contact us for advice on specialist applications. All our hoses can be supplied loose or we can manufacture hose assemblies to your specifications with a variety of end connections. Green Medium Duty – Applications: Waste Management, Agriculture PVC hose reinforced with an anti-shock rigid PVC spiral.completely free from phthalates with smooth bore, slightly corrugated outside . Properties: Particularly suitable to be used even at low temperatures, high mechanical properties,light, flexible, good bending, resistant to torsion, crushing, weather conditions, ageing, ozone, hydrolysis and most chemicals. Apollo SE – Applications: Waste Management, Agriculture PVC hose reinforced with an anti-shock rigid PVC spiral. Completely smooth bore, slightly corrugated outside. to torsion, crushing, weather conditions, ageing, ozone, UV rays and most chemicals. PLUTONE BIO – Ideal for delivery food liquids such as drinks, beverages, fruit juices, wine, vinegar and spirits with max. alcohol content of 20%, as well as powders and dry food. Not suitable for milk, diary products and fatty food. It is often used for filling machines and dispensers. Braided PVC Hose – Chemical resistant and suitable for food and drink distribution, our reinforced braided PVC hose is designed to be low maintenance and capable of withstanding high pressures. Clear PVC Tube – The clear economical solution for food safe, low maintenance transfer of liquids, gases, powders and granules.